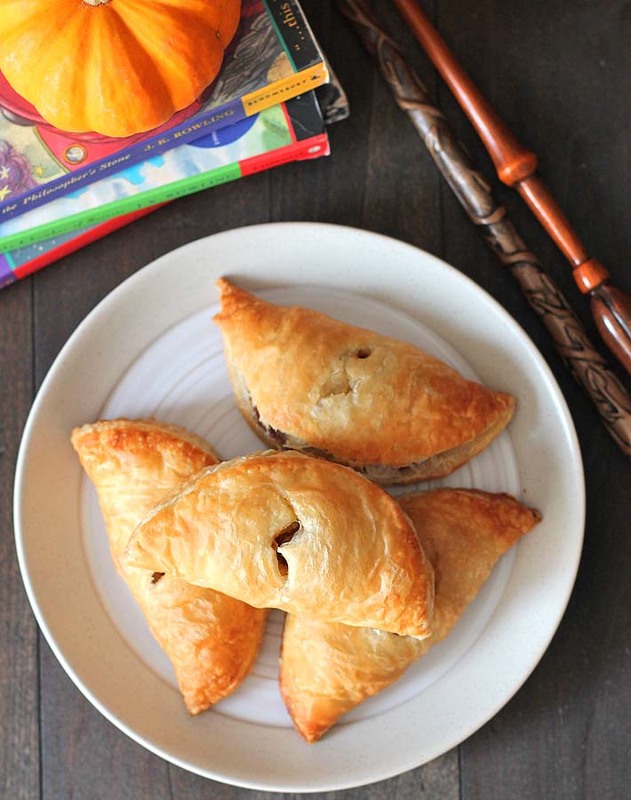 Curious about what pumpkin pasties from the “Harry Potter” series taste like? This is my take on the treat enjoyed by the characters in the books! 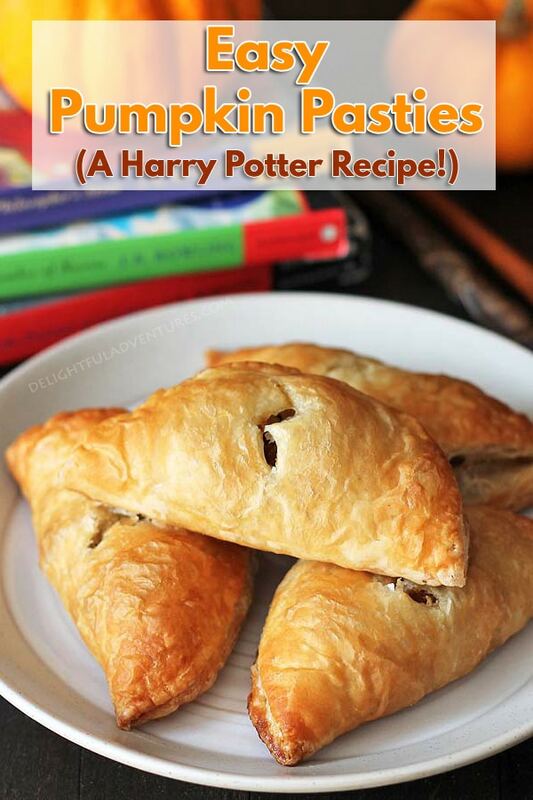 If you’ve read the Harry Potter series, you already know about pumpkin pasties. If you haven’t read the books and have never heard of a pumpkin pasty, then you’re in for a treat! Before I go any further, though, I do need to tell you that this is my take on what I imagine pumpkin pasties being like. There are many treats mentioned in the Harry Potter books, and we just have our imaginations to rely on when it comes to the taste of things (mmm…butterbeer). This recipe is how I imagine pumpkin pasties, in the book, tasting like. We were lucky to visit Universal Studios Orlando this past summer, and Diagon Alley and Hogsmeade are…magical…for lack of a better word. 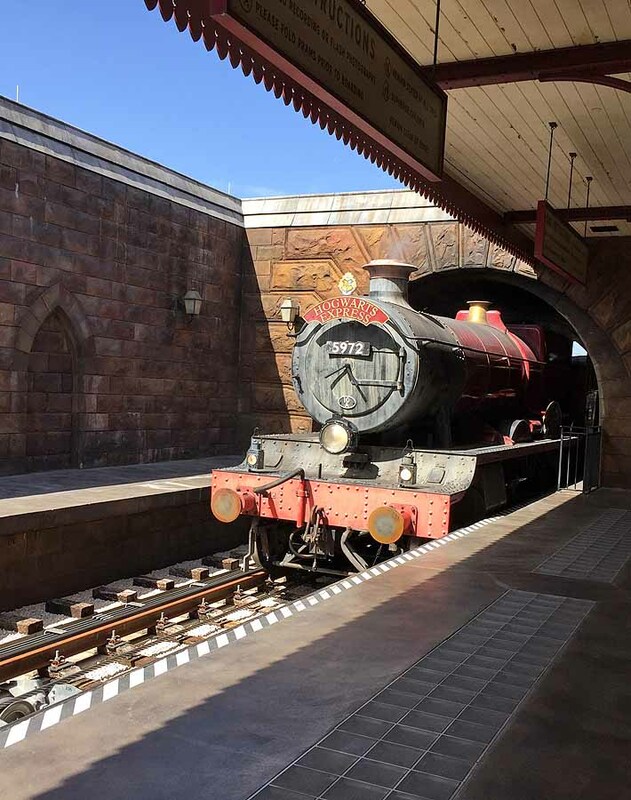 If you’re a Harry Potter fan, you know that the first time we hear about pumpkin pasties is while he is on his first journey to Hogwarts, on the Hogwarts Express (which we took a ride on at Universal!). The Honeydukes Express is the food trolley on the Hogwarts Express. The Trolley Witch makes her way through the train, selling an assortment of treats to the kids on their way to wizarding school. My kids just made their way through the books and movies and were as fascinated with the treats mentioned in the books, just as I was when I first read the series, years ago. When we visited Universal Studios Orlando, they did actually have pumpkin pasties at Honeydukes for purchase, but we couldn’t have them because of cross contamination risk (food allergies), so we made some ourselves! We all agreed that we imagine pumpkin pasties tasting like pumpkin pie, so that;s the direction I went in. The filling is pretty much pumpkin pie filling and the outside is flaky, crispy, puff pastry brushed with a vegan egg wash to make it golden brown and pretty. The pasties we saw at Universal Orlando had the scars cut into them as well, so we did the same to give them that extra Harry Potter touch. Pasties are not a new thing, I did a little reading and they are a UK food, and are very much like what we would call hand pies on this side of the world. They’re not usually made with puff pastry, like I have done, but rather a thicker pastry/dough. 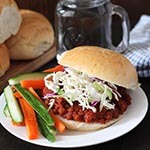 They can also be made sweet or savoury and filled with a variety of fillings. These pumpkin pasties also happen to be vegan, something I don’t think is usual with traditional pasties. My version is probably breaking every pasty rule out there, but that’s OK, because these are delicious. And in case you’re wondering, they’re pronounced past-ee not paste-ee (like I used to say!). 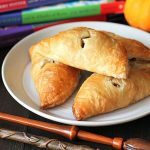 I hope you love my take on pumpkin pasties from the Harry Potter books, we make them often and they’re a fun treat to serve at Harry Potter or Halloween themed parties, while making your way through the books (either by yourself or with your kids! ), or…just because! 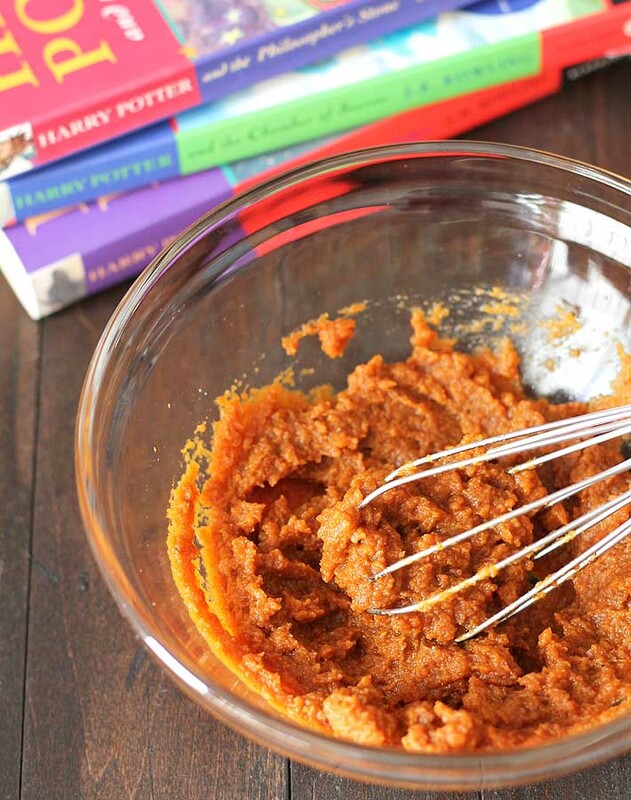 For more vegan harry Potter recipes, check out this post and check out Evanna Lynch (Luna Lovegood!) 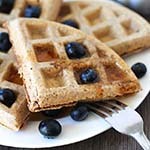 sharing some of her own favourite vegan Harry Potter recipes. If you make these, share a pic with me on Instagram by tagging me! 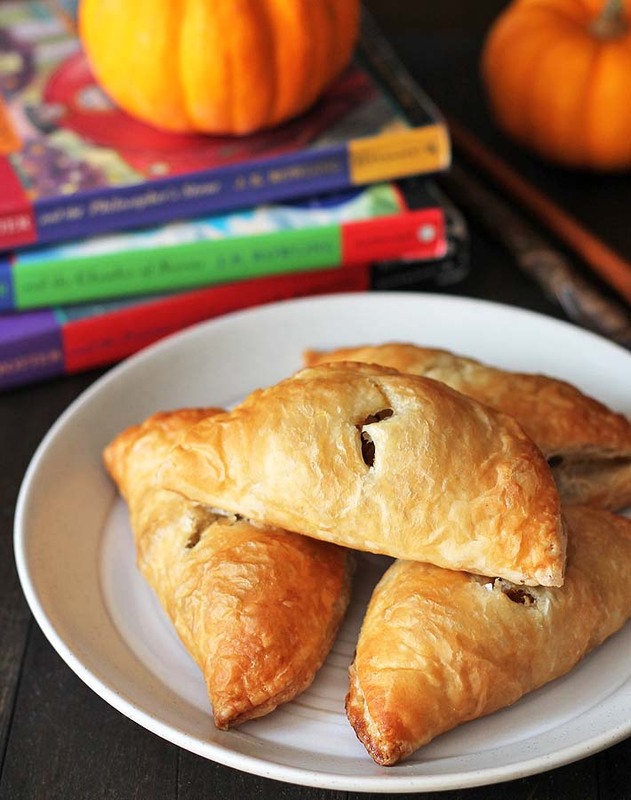 Curious about what pumpkin pasties from the "Harry Potter" series taste like? This is my take on the treat enjoyed by the characters in the books! These pumpkin pasties also happen to be vegan! 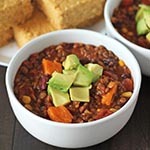 Add the unsweetened non-dairy milk and the maple syrup to a small bowl and mix to combine. Set aside. Add pumpkin puree, coconut sugar, ground cinnamon, ground ginger, and ground nutmeg to a bowl and mix until combined. Set aside. Roll out sheet puff pastry sheet. Place even amounts of the pumpkin mix on one side of each circle and fold the other side over to cover. Crimp the edges of each pasty with a fork to seal. Place each pumpkin pasty on the parchment lined baking sheet. Using a sharp knife, cut the Harry Potter scar shape into the middle of each pasty. 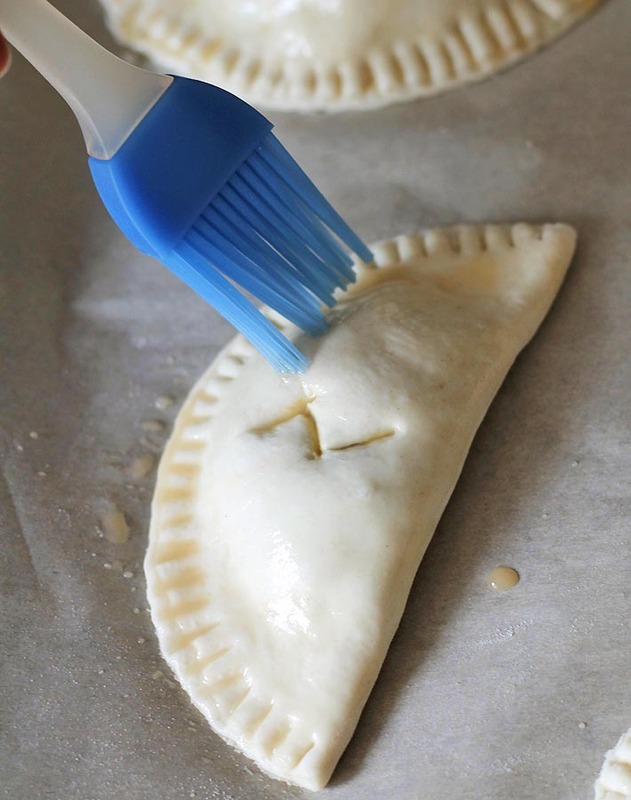 Brush the tops of each pasty with the vegan egg wash.
2 tablespoons of sugar is perfect for me, but if you prefer for this treat to be a little sweeter, after mixing the sugar and spices into the pumpkin puree, taste to see if it's sweet enough for you. Add a little more sugar for more sweetness, if needed. These pumpkin pasties are best when served the same day while they still have some crispness to them. Nutrition info listed below is for 1 of 4 pumpkin pasties, and is only to be used as a rough guide. Click here for more info on how nutrition info on this website is determined. Thank you so much for including me in your roundup, Francesca 🙂 Happy Holidays to you too!